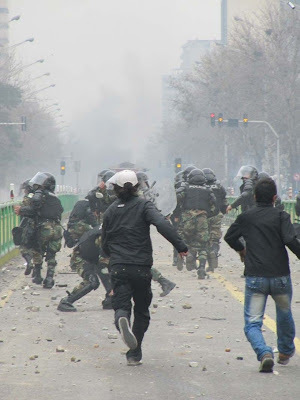 HIM Reza Pahlavi II calls on the Iranian Armed Forces to interfere in the Islamic Republic's brutal repression of freedom protestors - reminds them that it is their duty to defend their country and people from those that wish to inflict harm upon them. 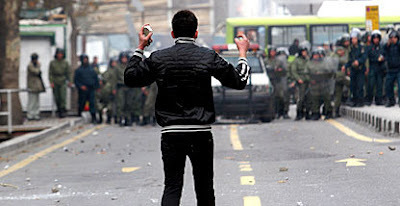 The people of Iran have continued to voice their rejection of the Islamic Republic and its leadership since the regime's staged s-elections; my fellow blogger Potkin Azarmehr has continuously covered the past month's anti-regime demonstrations (his blog entries provide a good timeline as to how this movement has grown and developed). Today marks the shiite religious day of "Ashura", which the regime normally "celebrates" each year with government-organized demonstrations and mourning ceremonies etc. - this year though things are different. 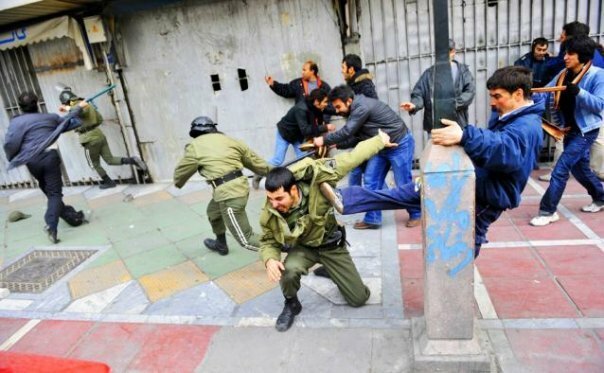 The people of Iran who are fighting to regain their country from this hell-sent anti-Iranian islamic regime have turned the tables on the regime by using regime-sponsored/regime-sanctioned days of importance to stage their anti-regime demonstrations and acts of civil disobedience. Today huge crowds are staging massive anti-regime demonstrations across Iran - protests have spread far beyond the capital and now cover all of the countries big and small provincial towns. Tens of people have been shot dead across the country in clashes between the Islamic Republic's security forces and the Iranian people. 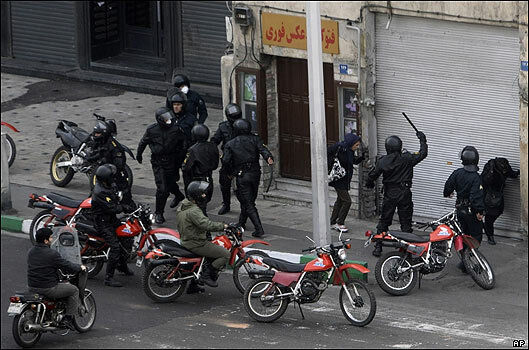 Iranian freedom-fighters take over a police outpost in Tehran. 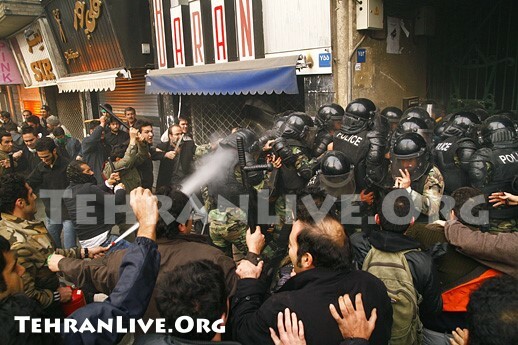 One of the regime's security officials is captured and led away by the people. Towards end of the clip there are graphic images of an Iranian man shot dead by the Islamic Republic's security forces. People running from a tear-gas attack. Many squares and intersections have been taken over by the people. 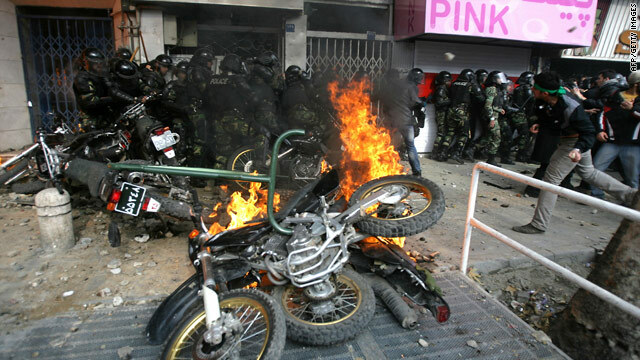 Security forces have retreated and their cars/motorcycles set on fire. People setting up barricades in the streets. Chants: "Don't be afraid, don't be afraid, we are all together!" 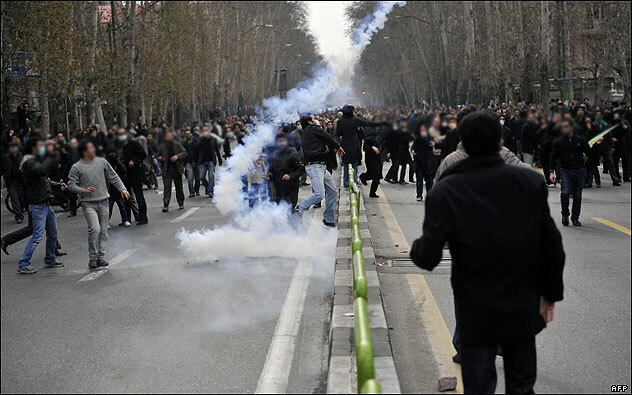 Iranian pro-democracy demonstrator killed by the savage Islamic Republic's security forces. People are no longer afraid of the regime's mercenart forces. Here the mercenaries are fleeing on foot - peoples power in action. 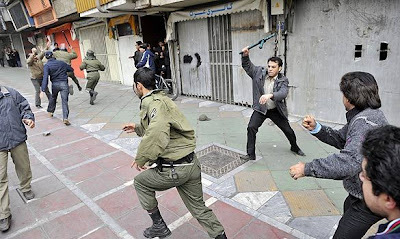 Iranian freedom-fighter facing armed security forces of the terrorist Islamic Republic with nothing but rocks in his hands. 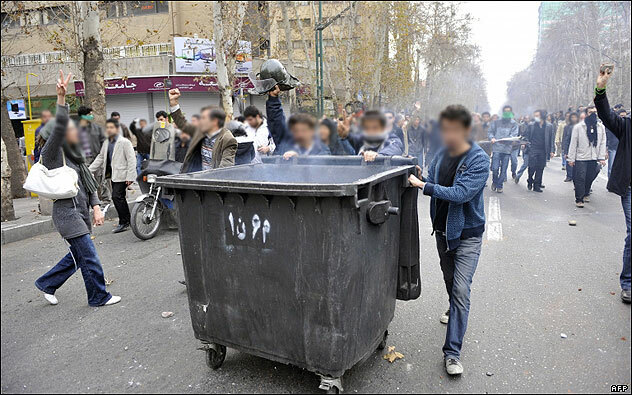 A street placard bearing the name of the terrorist Islamic Republic's leader is stamped on and defaced by Iranian crowds. Military helicopters encircling Iranian pro-democracy demonstrators in Tehran. 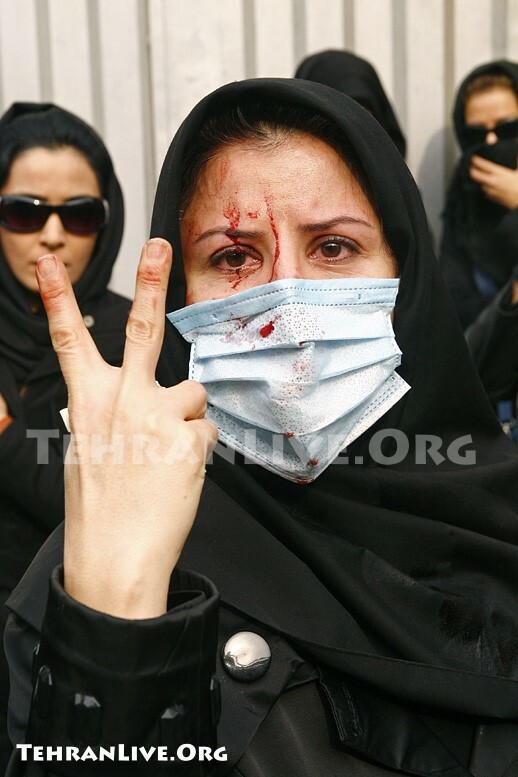 Fearless pro-democracy demonstrators capture the regime's mercenary thugs. Heroes of Iran's freedom movement. Basij (the regime's paramilitary mercenary unit) building is set on fire by Iranian freedom fighters. 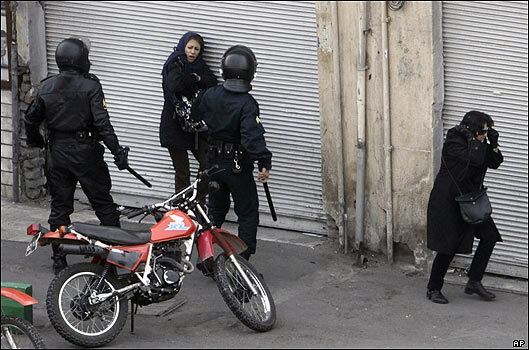 The Islamic Republic's security forces savagely beating and arresting Iranian women. Police car is prevented from escaping. 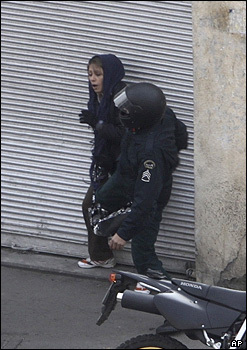 One of the Islamic Republic's mercenaries is arrested by the people. EXTREMELY GRAPHIC footage of an Iranian protestor shot in the head by the terrorist Islamic Republic's mercenary forces! “Every nation deserves the government it has.” Ayatollah Khomeini. A recent trip to the United Kingdom provided me the opportunity to pay a visit to the British National Archive in Kew. Reading pages and pages and taking notes on various topics of interest made me decide to use some of the collected information and write the following piece. One of the most under-studied and under-researched international personalities of the twentieth century has to be the late Shah of Iran, Mohammad Reza Pahlavi. The Islamic revolution of 1979, its causes, roots, pros & cons as well as its outcomes have been covered in numerous books and articles. The event has been discussed and to some extent analysed in various seminars, conferences, speeches and lectures regarding its historical, sociological or political contexts throughout the world for the past twenty-five years. Despite all this, very little has been given to study, explore and to understand the very man who for thirty-seven years led his nation in peace and harmony with the international community towards a steady and at times a rapid social and economical progress which guaranteed tranquillity “in one of the most troubled regions of this world” . With the exception of a few books, the world scholars, journalists as well as its academic institutions have conveniently forgotten for various political reasons - usually driven by economical motives of their respected governments, the very person who was responsible for peace in the Middle East. The modern world sometimes moves forward with such velocity that in order to find the remedies to a range of today’s world issues, it should pause and search the solutions in the not so distant past. I am not a scholar, nor have any claim to be a historian or a politician. I am simply a curious Iranian to whom the world’s deafening silence seems perplexing. Looking back at the events of the past quarter of a century, I would like to make an attempt and review certain aspects of my country’s last monarch’s ambitions and his global forethoughts. Aspirations that though may have appeared - as some Europeans claimed at the time as “Folly de Grandeur”, but the passing of years have given their seal of approval to his hopes and fears. Some may immediately ask me whether I would cover reasons for his failure too. My answer to them is; “No!” There have been so much unfinished debates and discussions worldwide on his fall that have only resulted in confusing the public. I believe it is time for the world to wake up and learn from his vision, achievements and his dreams; not only for Iran but for a world that had he survived, more than a million innocent men and women would have not perished from Kabul to New York. My intention here is to remind the readers - Iranian or non-, of who he was and whom the world lost. I particularly would like to address the Americans who have been under attack since the advent of the Islamic Republic in Iran more than any other Western nation on this planet. The former British Deputy PM carries on; “I was to meet the Shah in the Imperial Pavilion at Tehran airport for a brief introduction to the project, aided by various demonstrator boards, before he joined me for a flight. One of the demonstrator boards set up to be shown to the Shah consisted of a huge map of the world on which capital cities, principle airports and major flying routes were indicated in large, unmissable topography. About ten minutes before the Shah was due someone helpfully pointed out that there was no reference to Tehran on the map. The offending demonstrator board was removed from sight. Crisis averted. The Shah duly arrived. After a quick briefing we set off along the red carpet across the tarmac to the aircraft itself. During the flight it would be up to me to secure our sales and overflying objectives. The take-off was uneventful and we sped heavenwards to the 58,000 feet at which the aircraft is most efficient. However, I had no sooner concluded the initial pleasantries than the Shah, an experienced pilot himself, asked if he could join the test pilot, Brian Trubshaw, in the cockpit. In a second he was gone. I was in despair. There was no other time during our stopover when I could conduct a sales pitch or secure agreements before we were due to leave Tehran. But the Shah did not return until we came in to land. Down the steps we went, heading for the Imperial Pavilion. There were about 200 yards of red carpet between us and the waiting press corps. I had 200 yards in which to obtain – or not – the objective clearly set for me. I decided to go for it. ‘Your Majesty, I hope you enjoyed the flight. I would like to ask you if you would consider purchasing the aircraft?’ ‘Yes,’ he replied. ‘I would like two.’ So far, so good. ‘Your Majesty, we would be grateful for overflying rights across Iran on our journey to and from the Far East.’ ‘That would be quite acceptable,’ he said. The Shah must obviously have studied and consulted the proposal with his advisors and experts in the field prior to his meeting with the British minister. Considering the immense revenue generated from overlying rights to Concorde together with our national carrier as the only airline flying Concorde aircrafts - after British Airways and Air France, and the only airline in the world to offer supersonic travels between the European business centres to those of Australia and the Far East, Iran Air Concorde would have dominated most international business flights between the West and the Orient. Concorde never again succeeded in attracting a foreign investors in which its high costs of maintenance was a continuous issue until the crash in Paris on July25, 2000 brought its thirty year life to an end. Our economical progress coupled with social changes proved to be too rapid for us Iranians to comprehend and appreciate. As Iran progressed industrially through the 70s like every other nation in the world the sudden change of pace brought with it various but expected deficiencies and shortages; nothing that time and hard work could have not over come. In other words, they were teething problems of any rapidly advancing nation. However, higher standard of living resulted in higher expectations among Iranians. The consequence was a society with raised expectations but no patience for their government to materialize their demands. By this time Europeans were getting itchy on Iran’s arm spending and its armament budget – 26% of the total annual budget. Accusations were thrown and suspicions rose by the Western media. A Number of these countries were the very ones that Iran’s arms deals kept many of their citizens employed and therefore, helped their economy. Der Spiegel: Because they have some neighbours in the East whose intentions were not always quite clear. The Shah: Are they going to attack you? Der Spiegel: We hope not. The Shah: So why are you spending the money? I am spending the money for exactly the same reason. I take no chances whatsoever. I have friends, I try to even have more friends, but we cannot only depend on our alliances. Sometimes we could be let down. Another thing: do you all agree that the October war with Israel was a surprise? Consider the amount of weapons and the sophisticated weapons that were used against Israel – did you or did even the Israelis expect anything like this? Everyone was surprised. So I take absolutely no chances. I must not depend on anyone but ourselves. When Der Spiegel asked the Shah whether Iran can keep up with such growth – 20% annually, and reminded His Imperial Majesty that it took the Western countries generations to reach the present level and whether he thinks he can overlap this? The Shah responded, “Yes, our people are hard working and they have a craze for learning. We have all the incentives. We have our own traditions; we have a very old history – 3000 years. Why should we copy others? Der Spiegel: And Western technology? We had reached a position of strength from a borrower - years earlier, to a major world lender, including to those among the elite of nations. Mr. Healy, Chancellor of the Exchequer in a speech addressing the British parliament on July 22, 1974 thanked the Imperial Iranian government for providing Britain with a line of credit of $1,200m. He continued, “The Imperial Iranian Government has offered to provide the United Kingdom with a line of credit of $1,200m, to be drawn on in the form of three separate loans by public sector bodies within three years from now. In the same year, the Shah spoke of creating a new grouping of Indian Ocean countries on the basis of economic, political and eventually naval cooperation, to “secure our shipping lanes” and keep “non-regional powers” out. When Iran’s GNP (Gross National Product) rose by 40% towards the end of 1974 and when we bought over 25% of steel-making subsidiary of the Krupp group from its German owners - an agreement which could set the pattern for investment of Middle Eastern countries in Western Europe, the European Union was still considered at its infancy. The Shah, aware of the economical centers of power in the United States and the then European Economic Community, had come to conclude a plan of his own. A project that could help to counter balance the Western economical might with that of the fast Asian developing countries, - the Indian Ocean Economic Union or Common Market. Hornsby iterates that for the Indians to embrace the Shah’s scheme enthusiastically now, would be a considerable rebuff to the Soviet Union and an indication of the political price the Indians are prepared to pay for concessionary supplies of oil and other economic aid from Iran. In the same month, the Shah and the Empress paid an official visit to Australia. The Australian papers as well as those elsewhere printed that Iran was likely either to lend money directly to Australian Industry Development Corporation or become jointly involved with the government in Australian projects. But among all these, did the world appreciate his vision? Does the West ever want peace in the only region that can afford paying astronomical figures for the latest weapons and military technology? If the Arab nations and their leaders – particularly those in the Persian Gulf region, had the wisdom, they would have seen the prosperity and lasting peace that such fundamental plans could bring to our region and would have supported our government wholeheartedly. The Shah had said that his plan would help to create a positive and co-operative world partnership, which could usher in a decade of genuine development to equalise today’s disparities between rich and poor nations and harmonise their contradictions, which are the main source of animosities, conflicts and wars. As for the Iranian generation at the time, there were those who fully supported the regime’s policies and witnessed the improvements made in all walks of life. But there were also those groups of Iranians, in particular the students who received government scholarship, including a 90% discount on their return airfare, the cost of their living expenses together with their university fees while they attended universities in capitalist countries. Some of them joined the Iranian Student Confederation – a communist/socialist group, and did not miss a chance to demonstrate every time an Iranian official or the Shah paid a visit to a foreign country. These students who were spoiled by the Imperial government’s financial support believed that it was their right to live comfortably as students abroad - a student life enviable by other students, and their political prerogative to shout death to their sovereign. It is ironic that hardly any of our left wing activists had ever lived, studied or even visited any of the communist block! As the Shah’s fame and Iran’s fortune became center stage by the mid-seventies, so did European animosity towards him and our regime. Human Rights groups that have chosen to be silent in the past two and a half decades of the Islamic Republic’s genocide, either for their respective governments’ foreign policy such as “Constructive Engagements” or trade opportunities, would had not missed a chance to demonstrate their anger against the Shah or our officials in every possible way. This is at a time when in June 1974 Iran with its US$5.4 billion had come to occupy the 13th place among the 20 richest countries of the world. Two years later Iran’s income from exports reached the US$15 billion whereas its imports were only in region of US$13 billion, with 52% intermediate goods, 30% machinery and 18% consumer goods. Ironically, for at least the past thirty years the European press more than any Iranian opposition have been accusing HIM of not being democratic. He was called an autocrat at the best times and the “blood sucker of the century” at its worst! No one took the pain to understand the Shah’s reasons or his long desire for establishing democracy, a seed that was sewn in his mind from his adolescent years in Switzerland. Economic and social democracies were the first two steps of his bigger plan that he managed to create and nurture successfully. By the late 70s one could not find a hungry Iranian where only two decades earlier even our capital hardly had access to clean water or any sanitations. By introducing free meals six days a week throughout the academic year to every schoolchild whether from a poor or rich background Iranian children were fed the same nutritious food for free, on daily basis! Economic democracy had created a large middle class that is the backbone of every healthy society. Iranians where free to engage in any field of business and commerce, many who received government subsidies or long term loans with one of the lowest interest rates in the world. We were free to travel and were respected in all countries we visited. Social freedoms had allowed Iranians to flourish and hence, create one of the most vibrant and avant-garde societies of the Sixties and the Seventies. Having enjoyed the above, our people demanded for political democracy that the Shah wished to see fully established before passing the throne to his son. However, the social and economic democracies enjoyed in Iran of pre-Islamic revolution were the results of nearly two decades of hard work. When people demanded to have political democracy, certain initiatives had already taken place by the government on that path but Iranians wanted it not tomorrow but yesterday! Asking any Iranian today would agree that to reach political democracy we did not have to uproot our entire existence and had we been wiser and less manipulated, by now we would have been a prosperous nation with a powerful industry to match those in the Western world. With a difference that we would have created indigenous democratic institutions to meet our specific needs and desires, to match our tradition, culture and history and not simply by copying them from the West. In the meantime the European media began pounding the regime with baseless accusations against SAVAK – Iran’s answer to every other nation’s intelligence organization. 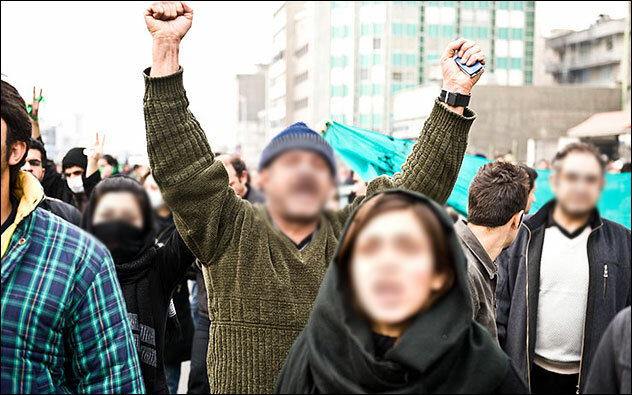 Once the Islamic Republic triumphed, most of those who were claimed to be executed or tortured by SAVAK, walked healthy out of the prison and took various offices in the newly formed Islamic regime. With full access to billions of dollars left in Iran’s coffers these individuals succeeded in knitting a network of terror which introduced the world to a new concept of Islamic fanaticism pursued by an international terrorism with wider and more horrific dimensions than ever before. Those who were once cheered as freedom fighters by the West and its human rights organizations, have today come to threaten the life of every man, woman and child in Western civilization. Even at such critical point the European Union still flirts with a mafia-like regime only to gain further lucrative deals. Two and half decades earlier the West with its powerful propaganda machine had unleashed their venom towards our Imperial government and accused us for our lack of respect for human rights in order to protect the very individuals who are today threatening the security of all European and mostly American citizens and their way of life. SAVAK portrayed as one of the most notorious organizations by Western media, its very own boss Mr. Hossein Fardoust who had grown up with the Shah and was sent to Switzerland with him to study, turned out to be a collaborator with the revolutionaries for many years! Massoud Rajavi, leader of the People’s Mojahedin Organization whose group has been listed by the US Congress as a terrorist organization and a collaborator with Ayatollah Khomeini was one of the prisoners twenty six years ago who walked out of a SAVAK prison with a clear bill of health. However, after his escape from the Islamic Republic’s tyranny which himself played an active role in its creation; in an interview in Paris soon after his arrival on August 7th, 1981 said to reporters, “Khomeini is worst than Hitler and the Shah was nothing but a choir boy." Once all political factions were pushed aside by the Islamic regime, they began accusing each other and that the revolution was stolen from them! I always wondered how could those self-appointed intellectuals who admitted losing to a bunch of theologians ever succeed in running the country? We always tend to think of historical tragedy as failing to get what we want, but if we study history we find that the worst tragedies have occurred when people got what they wanted … and it turned out to be the wrong objectives. In the midst of havoc and chaos created by the revolutionaries, our so-called allies never came to our aid; instead a member of Carter’s administration credited the Ayatollah with sainthood. Ten months later Khomeini awarded the Americans by taking their diplomats hostage for 444 days. Steven Hayward in his book published in 2004 under the title, “The Real Jimmy Carter” writes; “Carter betrayed a man whose fall to the Ayatollah Khomeini on Carter’s watch spawned the resurgence of fundamentalist Islamist terrorism that is now the War on Terror. 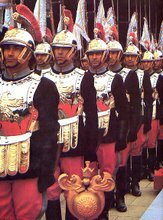 Two months after the Shah’s death in Egypt, Iran’s brave armed forces who were trained as first class troops with the best armaments but without their top generals who had all been executed in the previous twenty months, were the key factors in stopping Saddam Hussein invading our country in an eight year war with Iraq. Had the Shah of Iran remained in power, the Iran-Iraq war would not have occurred. By 1975, Iran’s superior military and economic power, supported diplomatically by her good neighbour policy that promised peace and progress for all, had drawn Saddam Hussein to a politics of mutual respect and friendly interaction. The Algiers Agreement of 1975 and Saddam’s expulsion of Khomeini from Iraq in 1978 attest to the efficiency of Iranian power and diplomacy. Had the war not occurred, a million Iranians and Iraqis would have not died in vain and several million would not have been forced from home and family. Moreover, Iran’s national power and international prestige, and her interest in the Persian Gulf, would have made it impossible for Saddam to invade Kuwait. With the fall of the Soviet system, Iran, boasting the most advanced economy, technology and military in the region, would be the hub of peaceful and profitable diplomatic, cultural, economic and commercial relations in Central Asia and the Middle East. Iran’s power and her friendly and rational relations with the West would have made the presence of American troops and weapons in the Persian Gulf region redundant and consequently anti-American feeling would not have been excited by the likes of Khomeini or Khamanei or Osama Bin Laden. Islamist movements and organizations would not have the Islamic Republic as a model for emulation or support for expansion. A powerful, secular, and peaceful Iran – non-Arab and non-Jewish- would be a pillar on which both Israel and the Arab world could lean for balance and security as they and the world strived for peace in justice and dignity. Today the Shah of Iran and Ayatollah Khomeini are both gone. While Khomeini left a prosperous country in ruins and damaged Islam more than any one else since its advent, the Shah’s legacy lives on to this day in the hearts and minds of every Iranian. Our youth today realising the catastrophic mistake that their parents made are eager more than ever before to learn about the truth. As Princess Ashraf called her book, it is “Time for Truth”. The new generation who has escalated their pro democratic and secularist demand in recent years have so far received no international support while paying the heaviest price. They would only need to go through the pages of their family albums and see their parents during their teenage years or when they dated each other to begin questioning them about the country we had during the reign of Mohammad Reza Shah Pahlavi. Many of them blaming the older generation for today’s ills are determined to put an end to this absurdity ruling our ancient land in the 21st century. All they expect from the international community is to stick by them and to stop cutting deals with the religious apartheid that is bringing our nation to a complete annihilation. 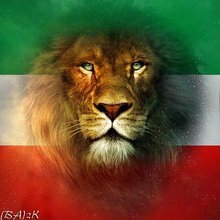 If some of those in the older generation agreed with Ayatollah Khomeini and brought a system of government that they deserved, the new generation obviously deserves better and will demolish the system whether the European Union decides to be with us or with the terrorists. One of Dr Koroush Aryamanesh' close colleagues recounts how the Islamic Republic was able to infiltrate their cultural association "Guardians of Iranian Culture" and by so doing lay the grounds to Aryamanesh' assasination. 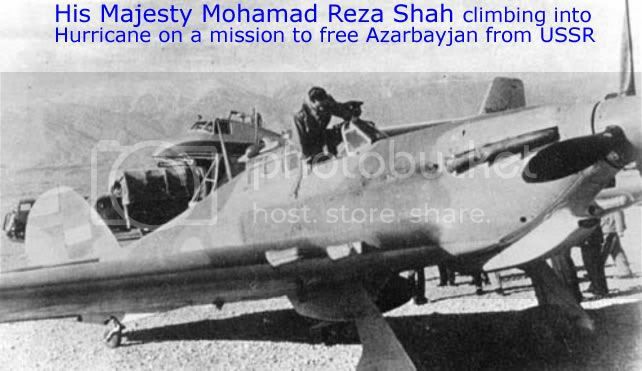 His Imperial Majesty climbing into a hurricane aircraft during the campaign to liberate Iranian Azarbaijan from Soviet occupation. In 1946 (21 Azar, 1325) the Imperial Iranian Armed Forces (Army & Air Force), under the direct command of the young Shah of Iran (only 40 Days after receiving his pilot certificate and having less than 100 flying hours), the Shah personally made four reconnaissance flights over enemy-occupied territory; this was the first time that the head of state of a country would personally fly over a war zone. Thanks to the bravery of the Imperial Armed Forces and leadership of His Imperial Majesty, the Soviets were driven out of Iranian Azarbaijan and the soviet "puppet" government of Pishevari was dissolved with many of its members seeking asylum under the protection of their masters in the Soviet Union. Dorood bar ravAneh pAkeh Shahanshah Aryamehr! UPDATE 1: HIM Reza Pahlavi's statement on the anniversary of 21 Azar (pdf).